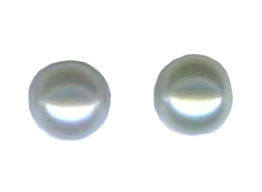 Because one customer has contacted me about the pearls on the larger 7mm pearl titanium post earrings coming loose after several months of wear. 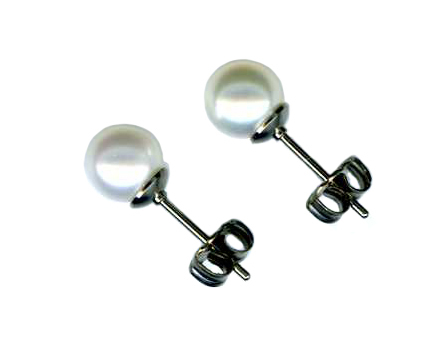 the pearl post earrings are currently unavailable for purchase. We are working on a redesign to fix this problem and hope to have the pearl earrings available again as soon as possible. If you have purchased a pair of the pearl posts and the pearl comes loose, please contact me to arrange for return for refund or exchange -- the standard 30 day return period limit does not apply since this is a design flaw. Grade A white freshwater cultured pearls hand set in titanium cup posts manufactured by Dirinda Patterson. � All earrings are made in USA with medical grade 100% titanium -- the best choice for those with allergic reactions to other metals.� Dirinda maintains strict quality control on metal composition so it is free from contaminants which are often the cause of allergic reactions.